Neil Gorsuch was hatched in a Federalist Society lab. With spare body parts stolen from Atticus Finch, Richie Cunningham, and Snoopy. Supreme Court nominee Judge Neil Gorsuch testifies Tuesday during the second day of his Senate Judiciary Committee confirmation hearing on Capitol Hill. Neil Gorsuch is in a tough spot. He is striving to sound a note of neutrality and apolitical dignity at a proceeding in which he has been served up to perform in a political reality show. It’s not just that as his confirmation hearings grind on, Gorsuch becomes palpably more and more squeezed between the ugliness of Republican obstruction of Merrick Garland and the fragile tyranny of the man who named him. That would be enough of a lift for any nominee. 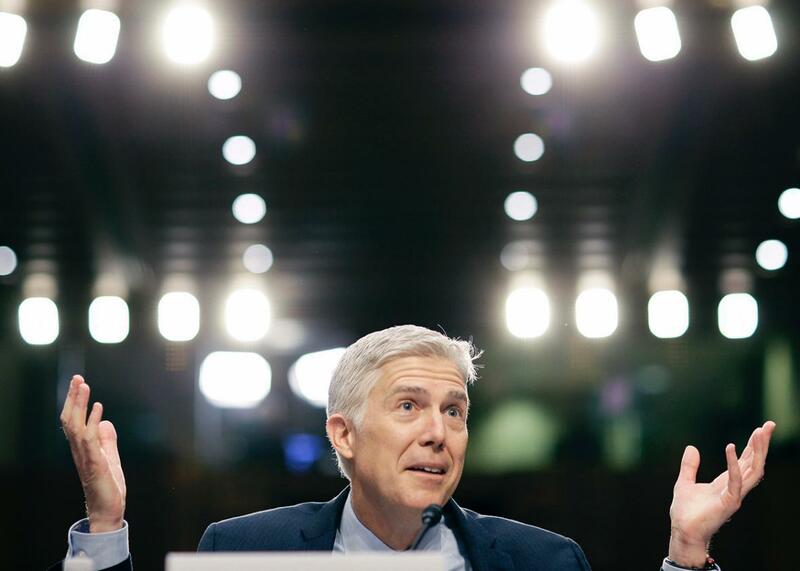 But then Gorsuch is also required to serve up a three-day performance art piece to show he is floating above all of this—that the meat grinder of Senate polarization and the soaring Shakespearean nuttiness of the man who nominated him have nothing to do with who he is and how he got here. To be fair, I keep finding myself wondering if Chief Judge Merrick Garland would have fared any better under these circumstances. Sure, he wouldn’t have been dragged down as far by the behavior of the president who nominated him, but he would have faced the same challenges of a politicized conversation about the role of judges and the same no-win subterfuge of refusing to answer substantive questions. In one sense, the uglier confirmation politics become, the hollower any judge’s claim to dispassionate neutrality must appear. Every judge is just cannon fodder for the big show. Every judge faces criticisms about hypocrisy and faux neutrality, and I imagine that had Clinton prevailed and Garland been on the hot seat this week, he would have also squirmed beneath unanswered questions and evasive generalities. But it’s worse for Judge Gorsuch, because although he really has mostly lived a judicial life above the partisan fray, the toughest questions he is being asked to answer—about Trump’s contempt for judicial independence and the Republicans’ treatment of Judge Garland and the corruption and dark money that have surely helped procure his seat—are not really his fault or his responsibility. It will surprise you not at all to hear that “I am my own man” and “nobody speaks for me” have become among the most frequent and plaintive Gorsuch refrains at this week’s hearings. “No man is above the law” is another, because dislodging himself from the garbage all around him is Gorsuch’s only way through. But none of those sayings matter. Gorsuch is dancing with the lobbyists, the senators, and the president that brung him. And somehow that makes his efforts to dance on the ceiling all the more jarring. Certainly, Gorsuch’s efforts to rise above the tsunami of crud and corruption that washed him up onto the Senate’s shores has been laudable. But at some point his protestations that he can’t talk about politics, doesn’t know what “dark money” is, and cannot vocally and specifically defend judges against attacks from the president (who just launched another salvo against judges) begin to look like a product of the machine that put him at the hearing in the first instance. Gosh and goodness on repeat don’t save that. There is no good way out of this tangle for Judge Gorsuch. For at least some of us in the room, the two straight days of performative big-hearted Westernness is beginning to chafe. No amount of references to midcentury paddle-wielding nuns and boyish mutton-busting extravaganzas can cover for refusing to answer even the most basic questions about doctrine or precedent. And even though Gorsuch is extremely affable and warm, one can’t escape the growing sense that the nominee we are watching today was hatched in an underground Federalist Society lab, with spare body parts stolen from Atticus Finch, Richie Cunningham, and Snoopy. And at some point you want to gently remind him that 1950s television called and it wants its vocabulary back. Nobody disputes that norms have been eroding at the Senate for decades. But for Graham to smugly suggest that blocking Garland for a year was the same as a Joe Biden hypothetical from 1992 is just silly on its face. “Let’s just say we’re both wrong” shouldn’t net out to a life tenured seat for Gorsuch in a year of broken institutions. What Republicans did to keep a seat open for a year is indeed without precedent. And what the Trump campaign faces in terms of its own dubious legitimacy is unprecedented as well. Judge Gorsuch shouldn’t have to answer for those things in an open hearing. But Garland and Trump are both seated at the table right next to him, and that is discomfiting, distracting, and delegitimizing, no matter how angry it makes the nominee. Senate Republicans and Gorsuch will continue to play the confirmation hearing as if the courts, the judicial branch, and Gorsuch himself were the Last Decent Thing in America. That movie has some real allure and salience, as every other norm of decency and deliberation is in flames in the dumpster out back. Nobody wants to protect the Last Decent Thing in America more than I do. But even if it’s still 1956 in Neil Gorsuch’s head, and the rugged open plains still stretch out as far as the mutton can see, here in reality the dumpster is on fire and everyone is getting singed. As we are learning sitting in this room on Capitol Hill, you can ask for gravitas and respect, but you cannot really growl or shout when it isn’t forthcoming. America broke it and America bought it. All of it. And no one person gets to pretend we aren’t all on fire.